Wow, I just got back into town last night and my inbox is flooded! So, it's going to take me a little bit to catch up. But, here's the weekly Disney news updates all in one post so you don't have to go searching for it! Read on for more on People Like Us, a special Avengers-themed party idea, Brave, the Odd Life of Timothy Green, Chimpanzee and more! In celebration of Mother's Day, we are also sharing with you a template to make a pop-up card! 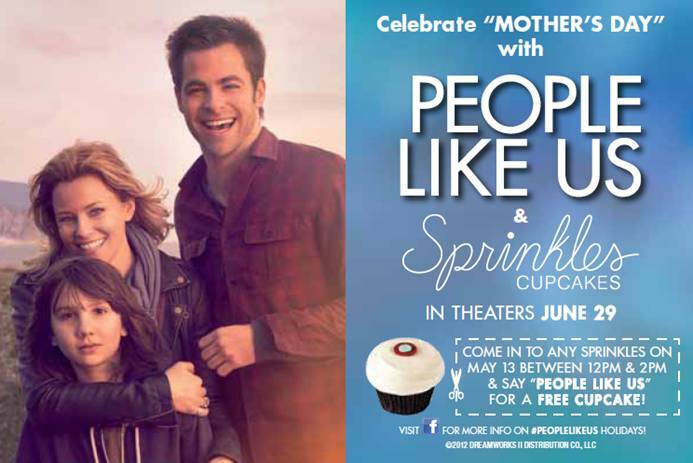 First up is a new featurette from PEOPLE LIKE US, live in theaters Jun 29. And...with Mother's Day coming up, don't forget to go in and grab your free cupcake!! “Like” PEOPLE LIKE US on Facebook. 1. 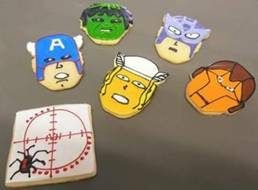 Use any sugar cookie recipe and use a cookie cutter to make character cookies. Can't find them? Just use any oval shaped cookie cutter then and flaunt those decorating skills! Once your cookies are baked and cooled, start decorating. 2. Use store-bought icing or make your own Royal Icing, using food coloring to create the necessary colors: green, yellow, blue, black, white, and brown. Place each color in a piping bag. -Royal Icing: Mix 3 egg whites (dehydrated if possible), at room temperature, 4 cups powdered sugar, and 1/2 tsp cream of tartar with a little warm water until smooth. Add in optional food coloring. 3. Outline the cookie in your base color. Let's use the Hulk as our example, so outline the shape in green, then fill in the outline with green icing, covering the whole cookie. Tip: A paintbrush may make it a little easier to paint the cookie. Let the base dry for a few minutes before adding additional colors. Outline the Hulk's hairline in black and then fill it in with black icing. Use those artistic skills to continue bringing your favorite Avengers characters to life. "Like" MARVEL’S THE AVENGERS on Facebook. Follow @MARVEL’S THE AVENGERS.----------------Next up, Brave from Disney and Pixar in theaters June 22. I have a couple videos for you to watch and they're both great. Teehee. Are you brave enough to watch? And of course, a special Mother's Day feature: "Like" BRAVE on Facebook. Follow @BRAVE. ----------------Have you heard about THE ODD LIFE OF TIMOTHY GREEN that premiers on August 15th? If your answer is no, then find out with this newly released trailer. 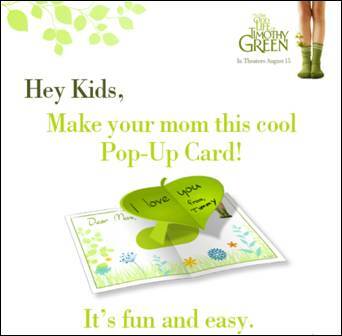 Or just watch it anyways, I did...it was magical...And if you don't have a card made out for mom yet, here's a great free template to make a pop-up Mother's Day Card courtesy of The Odd Life of Timothy Green. "Like" THE ODD LIFE OF TIMOTHY GREEN on Facebook:----------------Remember the Disneynature conservation program “See ‘Chimpanzee’ Save Chimpanzees.” we were promoting earlier? Between April 20-May 3, 2012, those who saw Chimpanzee supported a great cause because for every moviegoer, Disneynature made a donation to Jane Goodall Instititute through the Disney Worldwide Conservation Fund. The conservation program helps to protect 129,236 acres of wild chimpanzee habitat and educate many on the importance of saving their habitat. It just goes to show that a little awareness and a little sharing can help to make our world a better place. i havent heard of these movies before but they all sound like something i would enjoy watching! I really want to watch Kilt. I love Disney movies!